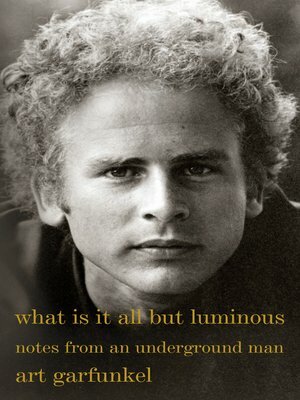 In What Is It All but Luminous, Art Garfunkel writes about growing up in the 1940s and '50s (son of a traveling salesman, listening as his father played Enrico Caruso records), a middle-class Jewish boy, living in a redbrick semi-attached house on Jewel Avenue in Kew Gardens, Queens. He writes of meeting Paul Simon, the kid who made Art laugh (they met at their graduation play, Alice in Wonderland; Paul was the White Rabbit; Art, the Cheshire Cat). Of their being twelve at the birth of rock'n'roll ("it was rhythm and blues. It was black. I was captured and so was Paul"), of a demo of their song, Hey Schoolgirl for seven dollars and the actual record (with Paul's father on bass) going to #40 on the charts. He writes of the hit songs; touring; about being an actor working with directors Mike Nichols ("the greatest of them all"), about choosing music over a PhD in mathematics.